The steel pendel bearings were designed to transfer unbalanced traffic loads from superstructure to piers, which may cause the twisting force in longitudinal direction of the bridge. From the fact above, the Rama IX bridge�s pendel bearings are the non-redundant members. Namely, the bridge will not be functioning properly if the pendel bearings are malfunctioned. 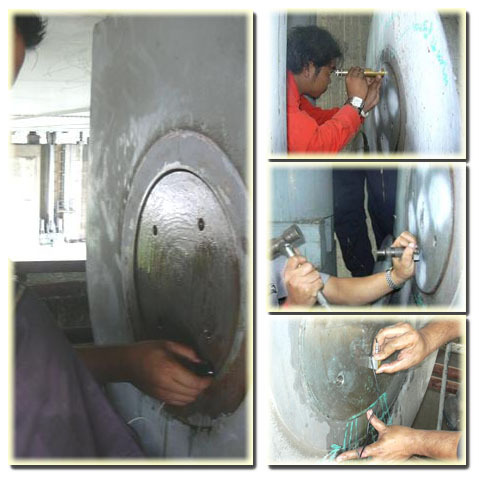 In 2005, The Expressway and Rapid Transit Authority of Thailand (ETA) assigned IMMS to study the Rama IX bridge�s pendel bearings, to inspect and assess the accumulative damages on bridge�s pendel bearings under various loading conditions and to evaluate pendels� remaining service life. 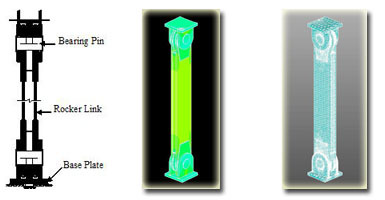 Visual inspection, non-destructive testing, field measurement, 3D finite element model analysis and recommendation for repairing and strengthening of pendel bearings were also performed in this project.